One of the biggest challenges and one of the biggest reasons that the life, love and the spark fades in a relationship is that you start communicating in ways that don’t keep you close and connected–and these are what we’re calling the “old fashioned” way. “I’ve been a long time subscriber of your newsletters and I think they’re great–I’ve learned a lot from you guys but my question is why can’t my hubby and I get along? We love each other but we can’t seem to communicate and there’s some trust issues there too because something that happened a couple of years ago. We certainly appreciate AG’s question and here are some ideas that might be able to help both AG and you if communication is a problem for you in your relationship. When it comes to relationships, where many couples fall short in creating a love and spark filled relationship that lasts is that they really do love and communicate the “old fashioned way” and THIS is not good. It’s tragic but…what we’ve found is that most people wait until it’s almost time to call the divorce attorneys in before they start seriously trying to do things to improve their relationship. Unfortunately, in many cases, by that time it’s a little too late. One of the quickest ways you can start to turn any relationship around, build more trust and create a closer bond and connection between the two of you is by solving a couple of really basic communication challenges. What’s interesting about these communication challenges we’re talking about is that most people don’t even realize they have them until we point them out to them. They have these communication problems because they are communicating the “old fashioned” way–the way they saw their parents or grandparents talk to one another. They communicate from habit and not from a place of consciously trying to create a heart connection with other people. **Making a lot of assumptions and not getting clarity when you don’t understand. You can start learning how to communicate with the truth that’s inside you without pushing your partner away. 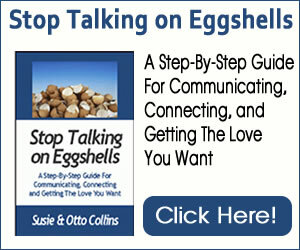 Another of our favorites is when someone does what we call “talk on eggshells” all the time. It’s obvious that there’s love there at some level but there’s also some kind of fear that won’t allow them to say what’s on their mind, what they think or how they feel to their spouse or partner because of how they believe their partner will react to them if they did this. Another thing that happens very often that causes a lot of damage to relationships is when one or both people in the relationship have done something that destroys the trust in the relationship and this pain continues to drive a wedge between them. In this case, you need to turn trust around and fast. Said another way, everything you do will either help you get what you want or move you further from it. The question is–Would you like better communication, more love and more trust right now? We invite you to begin learning how to communicate in a better way and drop your old fashioned way of talking to those you love. If you do, we’re sure that you’ll feel and see more love in your life.